A German town was evacuated for six hours to allow a World War Two bomb discovered there earlier in the week to be defused and disposed of. Some 18,500 people were moved from Ludwigshafen in central Germany from 08:00 local time (06:00 GMT) to 14:00. 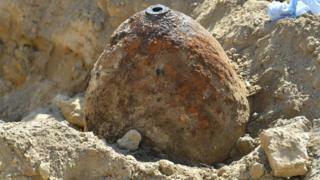 The aerial bomb, weighing 500 kg (1,100lbs), was discovered by construction workers. Germany remains littered with unexploded bombs from the Allied bombing campaign against the Nazis. The city's authorities posted a photo of the corroded bomb on Twitter. It is believed to have been dropped by US forces during WW2. In September 2017, Frankfurt evacuated 70,000 people after a British WW2 bomb was found in the city. The main train station in the capital Berlin had to be evacuated in April after a 500kg bomb was uncovered by construction workers. Why do World War Two films have an enduring appeal? Video Why do World War Two films have an enduring appeal?